The question that haunted the entire Blum family was: Why? Why would he ruin his life in such a spectacularly foolish way? At first, Alex insisted he thought the robbery was just another exercise in the famously daunting Ranger program. His attorney presented a case based on the theory that the Ranger indoctrination mirrored that of a cult. 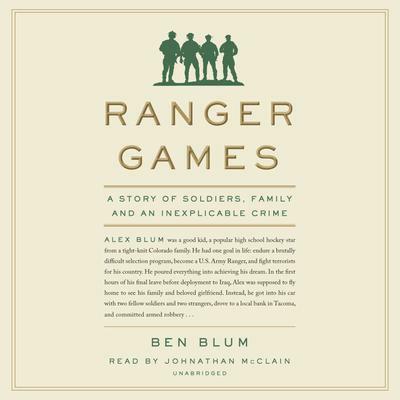 In the midst of his own personal crisis, and in the hopes of helping both Alex and his splintering family cope, Ben Blum, Alex’s first cousin, delved into these mysteries, growing closer to Alex in the process. As he probed further, Ben began to question not only Alex, but the influence of his superior, Luke Elliot Sommer, the man who planned the robbery. A charismatic combat veteran, Sommer’s manipulative tendencies combined with a magnetic personality pulled Ben into a relationship that put his loyalties to the test.